A large force of Mosquitos from RAF Coastal Command’s Banff Strike Wing exit a deep-sided fjord along Norway’s rugged, heavily defended mountainous coast. In the distance, smoke and explosions reverberate from their successful rocket strike against enemy coastal shipping, destroying yet another cargo of iron ore destined for the furnaces of Germany’s industrial war machine. Above them P-51 Mustangs provide top cover support should any patrolling enemy fighters decide to make an appearance. The de Havilland Mosquito was arguably the finest multi-role combat aircraft of World War II and, remarkably, one of the few front-line aircraft constructed almost entirely of wood - few other warbirds were built for so many different duties. Amongst its countless roles it formed the core of Coastal Command’s legendary anti-shipping strike force, and it is this role that is the subject of Robert Taylor's thrilling new painting, paying tribute to the Mosquito crews of World War II. 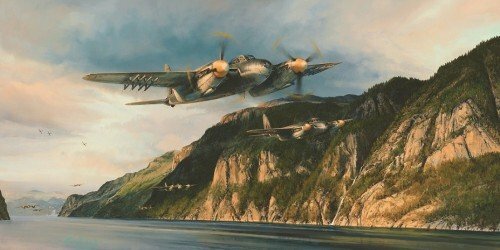 Fresh from the studio of the world’s master aviation artist, each print in Robert Taylor’s compelling new edition has been signed by some of the most respected Mosquito aircrew of World War II to make this wonderful collectors’ item a timely piece to be treasured for the generations that follow. THE LIMITED EDITION Every print has been signed in pencil by THREE highly distinguished Mosquito aircrew, together with the artist Robert Taylor. Each print is individually hand-numbered.